I guess its pretty fair to say I don't update my LJ anymore. I've tried to write something summing up the last 6 months, and I really can't. Things are good, though. If you want to keep up with what's going on with me, I'm mostly on Facebook now. Let me know if you want to connect on there. I also post a bit on Twitter, same username. My main interest these days is gardening. My garden site is here: www.gardeninboise.com. I'll be around a little, checking communities and stuff. I hope everyone is doing well! Wouldn't you know, the week before my trip to New England has been one of the worst in a long time. It seems like everything is just piling on! First of all, my Grandma is very sick, and will probably pass away in the next week (while I'm gone!). My mom flew down to Kansas today to see her, she's in a hospital in Wichita I think. I'm very sad of course, but my Grandma has been sick for a long time, there's only so much a person can and should have to take. Jon's mom went to the hospital the other night as well, she thought she might have appendicitis but it wasn't that, and they don't know why she was in so much pain. So she's at home recovering. Monday and yesterday (though not as bad) my hips were *killing* me. They were so sore I was having trouble getting up and walking around, plus sleeping was uncomfortable. Luckily I'm feeling a lot better today and hope it stays that way. Work has been... frustrating as well. So much to do, so little time. And to top it all off I've been so worn out, but still forcing myself to clean, go shopping, and otherwise get ready for this trip. Wow. What a busy month August turned out to be. Lots of work, a few little road trips, plus some REALLY annoying allergies. I've been wanting to update my LJ, but especially in the past few days. What was holding me back was I couldn't think of a subject. That may sound silly, but because my subjects have been one word for a long time, I really have to think about how to best sum up what I'm going to write about. A lot of the time, once I think of the subject, it reveals a lot. In this case, I had been thinking about it for a few days and thinking how I've been feeling really frustrated and stuck. It just came to me: my whole life is filled with potential right now. Yes, normally that's a good thing. But when potential doesn't ever change into success, something you can see and appreciate, it starts to look a lot like failure. My house has a lot of potential to be awesome. It needs some nice paint; my mom and I will be starting on that in 2 weeks. I've narrowed down colors for a few of the rooms and that's pretty encouraging. I need to make a lot more decisions, and of course actually get started! We also need new curtains and/or blinds in every single room. We need new barstools, new furniture for the family room (since we're moving a nice TV down there today), shelves and decorations/artwork. We've been trying to get going on these changes for a long time, and it feels like it will never get done. My garden has a lot of potential. This year was an awesome experience, I learned a lot about what works and what doesn't. I have big plans for next year and I'm afraid that it will be too much work or be too expensive to fulfill the ideas I have. The front yard needs TONS of work; all new shrubs, strawberries thinned out, new mulch, reshape the flower bed, gutters on the house, new flowers everywhere... its so overwhelming. 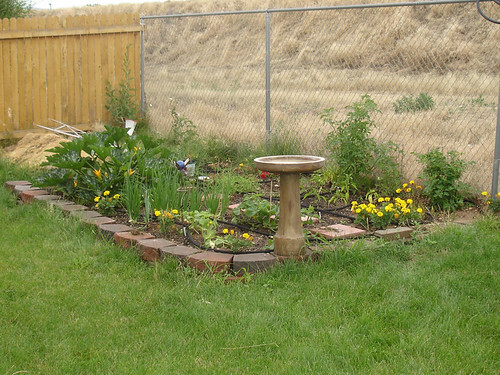 The back yard is similar; reshape beds, all new plants, replant a tree from the front yard, expand the veggie garden. Plant some honeysuckle and clematis along the fence. So much to do! And finally, I'm feeling like I'm in a rut job- and skills-wise. I decided I'd like to back to school (I have wanted to for awhile), but not for something art related. Most likely, it would be for Environmental Studies. I have the potential to learn about something I'm very interested in, but there are a lot of obstacles to get around before that happens. So today I'll try to make a dent in all that by researching furniture, paint colors, and working on my garden plans. That should help me feel not so stuck! We're really starting to plan for our trip to the East Coast in September - Jon and I are going with his dad and stepmom. I'm getting really excited!! Our main destinations are Maine, Vermont, and New Hampshire. I've never been to that area (the only place I've been on the East Coast is Florida) so this is all new to me. I'm looking at websites for ideas for activities. The difference a well-designed travel site makes is HUGE. I'm struggling to find a really good Vermont site. The best I could find so far is http://www.travel-vermont.com. It looks like there's some awesome places to hike and camp in Vermont. Here's the best I've found for Maine: http://www.visitmaine.com. I'm most looking forward to lighthouses in Maine! And the beaches look amazing! The best site I came across for New Hampshire is this one: http://www.visitnh.gov. There are tons of waterfalls listed on that site and I want to see a bunch! I don't know if a week vacation is going to be enough! Things I need to do before the trip: clean off my camera's SD card, find my rechargeable batteries, get good hiking shoes, get two new swimsuits (a one piece and a two piece), go clothes shopping for some NICE clothes (I am so sick of my wardrobe at this point)... and I'm sure I'll think of more. It's possible I may be going to Florida at the end of August for work, as well as New York in September, also for work. I think I would die of excitement if both those trips became reality. Whee! 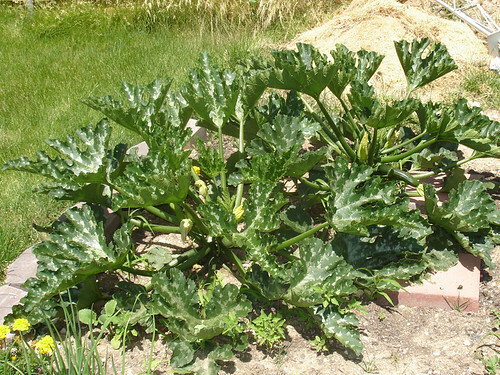 My zucchini plants are growing like mad! I have quite a few zucchinis I've picked, but I can't keep up with eating them so the logical solution was Zucchini Bread! So far I've made two batches of 2 loaves each. One had chocolate chips, the other didn't. They are all yummy. I gave two loaves to coworkers... so I'll need to make more soon! Hehe. This has inspired me to try other kinds of baking (I've never been all that good at cooking/baking) so we'll see how that goes. I got some awesome things for my birthday the other day, plus I bought a couple things for myself. Including two expansion packs for The Sims 2 (Pets and Seasons). :D I realized that none of my computers would run Sims 3 so I thought I'd build up my Sims 2 install a bit. I love that game way too much!! It's so fun. With two new expansions there's so much to do and get used to (glad I didn't buy three like I was planning at first). I'm trying not to play TOO much since I have things to do! I also dreamed about the Sims last night. Inevitable, really. I got a bird feeder from my parents and WOW do the birds love it. My cat loves it too. I wonder if she should spend so much time watching them, I almost feel like its bad for her, like she's watching hours of TV or something. I'm so worn out. I want to get back into exercising every day but geez. My head still hurts from whacking it the other night. That's my excuse. And its a good one, really. Right? :D Yeah. And I'm constantly hungry lately, that's probably good. I have a metabolism! Woo! Haha my cat just tried to stretch her back leg as she was walking, she looked so silly. She almost fell over. Damn, just what I needed. I just slid off my bed and hit my head on the bedside table. I have no idea how that happened. I don't feel sick, I'm not seeing stars, so I don't think I have a concussion. The back of my head just hurts like hell. I'm icing it for now and I'll see how I feel tomorrow. I hate going to sleep right after that but it's 1:30! And tomorrow my parents are coming over to celebrate my birthday... I would hate to have to postpone that. Edit: OK I feel a little sick... Gah what a disaster. Yesterday we drove to Salt Lake City (about a 5 hour drive) and back! It was a long day. We started at 8am, had a nice, uneventful drive. Then we stopped by his Mom's new house in Layton, and dropped off the stuff we packed in my car for her. She left for work, and we drove an hour south to Provo to see Jon's sister and her husband's apartment. His sister was at work, so we took her husband to an early dinner. I do miss hanging out with them, now that they've moved. After the meeting, we went to second dinner with Jon's sister. She is getting really big (her baby is due in a month)! Sat there for awhile and chatted. We had decided that we'd drive back home at that point instead of staying with family or whatever. We got home about 3am. LONG day. I'm glad we came home last night instead of today though, I have another long day tomorrow and it was nice to have the whole day to relax. And on a totally different note, I'm confused about Jon's reaction when I told him about the good news that there is now a generic version of the Plan B pill. He said "that's stupid". I was speechless for a minute. Then I said "it's like $50 bucks at this point, its really great that it will be cheaper". And then he said something about how it should be the "last resort" and I'm thinking, since when is "plan b" ever the last resort? That's like Plan H, or Z for that matter. He said that people "shouldn't be buying it all the time". Actually, its a great thing to have on hand. I did not know where to start figuring out where the disconnect/misunderstanding was... and then he just walks away, like he does when there's something that makes him uncomfortable or whatever. I rarely get irked with him, but that's one thing that really grinds my gears, the walking away thing. Because then my "Jon..." sounds really whiny or whatever. I think maybe I haven't explained well enough that Plan B isn't actually an "abortion pill". Whatever. Damn it kids, its not the Fourth of July yet! Stop launching fireworks. It's almost my birthday! I'm still such a little kid inside (even though I'll be 27) that I get excited about my birthday. Haha. I'll be getting that Mac computer around that time, so that will be fun!! I can't believe how busy things have been. Healthwise, things have been interesting. I went to a new doctor to get a second opinion, and they thought I may have a Vitamin D Deficiency, so I'm taking supplements for that. No change in energy levels as yet, which is what I need. We gave away a bunch of furniture this morning, that was awesome to get rid of that stuff. My parents helped us move stuff and clean up on Sunday. I now have a library room dedicated to all our books. Awesome!! I will be getting Jon's dad's Mac Mini for now and save up for an iMac around Christmas time. The Mini should be here by next week, I can't WAIT to take some stuff off this computer (mostly music and podcasts). And then put games on it... oh I'm so excited. I got a new battery for my MacBook this week, my old one was bulging and not working very well!! My kitty has something wrong with her foot, it has a little raw spot between two toes. I will have to take her to the vet, and I dread that. She's awful at the vet. -Buy Jon's dad's Mac mini. It is 1.5 years old, has a 2.0Ghz dual core processor and 2GB RAM. His RAM is probably NOT upgradeable, his model doesn't support 4GB. I have a nice monitor, Apple mouse and keyboard so I really just need the computer. He wants $500 for it. Maybe if I could talk him down to say, $400. -Buy a new Mac mini with 2.0Ghz, 4GB RAM, with a few other improvements including graphics performance for $900 (including Apple Care). 2.26GHz processor would be $1050. -Buy a new iMac. If I'm going to buy something new I might as well go all out right? And this way I could do WORK on this computer and give my laptop a break. 24in monitor, 2.66GHz (or 2.93) and 4GB RAM. Refurbished I could get the slower one for $1300, or the faster for $1550 (plus $170 for Apple Care).